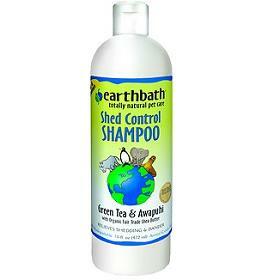 Earthbath blended the finest antioxidants and skin moisturizers found in nature to create this Shed Control Shampoo. This potent formula contains organic fair trade shea butter, essential green tea leaf extract, ginseng, omega-6 fatty acids, awapuhi and other natural humectants & emollients to nourish & detoxify skin and rejuvenate coats while controlling excessive shedding, dander and associated allergens. Naturally, this pH-balanced soap-free shampoo will thoroughly clean & deodorize, leaving pets brilliantly soft and heavenly scented.